A lot of the stuff I add to the website are things that I would want for myself. For example, my Climbs section was started because I was spending a lot of time looking for interesting roads to climb when training for my first Mitchell. It grew from there. The Routes section came from the same place. 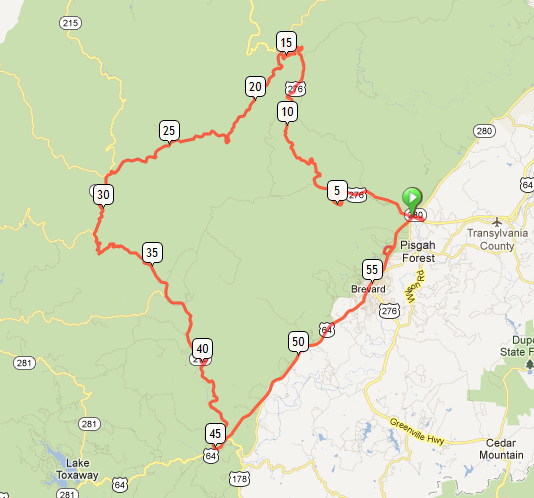 When I am in the Blue Ridge area, I often don’t have time to seek out group rides to show me around. I am always looking for convenient routes that I can take by myself. I find a lot of them on the internet, and some I make for myself. It would have been amazing had there been a single resource where I could find them all. If I cannot find it, why not create it? This section was conceived a few months ago when I was training for my second Mitchell. It would have been too time consuming to put together a list of cue sheets like the Blue Ridge Bicycle Club has done to perfection. Instead I decided to use newer technology and use RideWithGPS links. Because people all over use this software, the content is vast and limitless. It also allows people to view the route on a map, see the elevation profile, and download it to their GPS device. To begin, I asked a few friends if I could use theirs. Special thanks go to Neil Turner, Michael Powell, Scott Baker, John McSwain, and Jeff Dilcher for providing a starting point. As of right now, we have routes that begin in Spartanburg, North Greenville, Brevard, Sylva, Tryon, Atlanta, and the North Georgia Mountains. In time we will add plenty more. I am looking for a good source of content for routes out all over the Southeast, but I would specifically like to find some from Asheville, Boone, and Roanoke. If you know of anyone who creates these for your town, please send them my way. Keep an eye on this section as I expect it to grow. Keep in mind that there is danger in undertaking any of these routes. You’ll notice a disclaimer on every page for a reason. Do your research and make sure you are equipped before trying these. While some are easy, others are epic rides that few people can accomplish on their own. This entry was posted on Tuesday, July 17th, 2012 at 4:44 pm	and tagged with Atlanta, blue ridge, cycling, Greenville, mountains, north georgia, routes, spartanburg, sylva, Tryon and posted in Site News. You can follow any responses to this entry through the RSS 2.0 feed. Great work, Aaron! Very handy resource to have! I’m going to rush right out and get started on not climbing any of these right away!